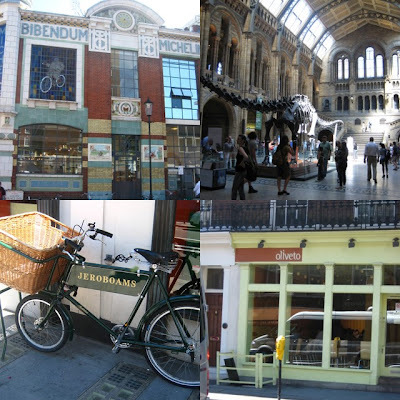 London Scenes clockwise from upper left: the Bibendum building, the main hall at the Natural History Museum, the facade of Oliveto on Elizabeth Street and a bicycle with a basket from Jerobaoms. We all got up very early and made our way downstairs to The Lounge for some breakfast but the place was full so we were led to the adjacent room of Pearl, celebrity chef Jun Tanaka’s fine dining restaurant where breakfast is also served. The buffet was not that interesting and the atmosphere at the restaurant was a disappointment – cold and formal, not a place I’d like to have dinner in anytime soon. Pity as the cuisine of Jun Tanaka must be good. After a quick breakfast, we went to Brompton Cross right by the Bibendum building to take a walk and enjoy the surprisingly warm and sunny London day. We window shopped to kill time before the museums opened at 10:00 a.m. From the Fulham road, we walked to Exhibition road in South Kensington’s museum row to the Science Museum. Our 6-year old went running from exhibit to exhibit but enjoyed the basement gallery with the Secret Life of the Home where he could try everything. Then we headed next door to the Natural History Museum to the Red Zone for the Earth displays then down to the Green Zone’s Creepy Crawlies exhibit. At that point, we’re all tired and hot and decide to go to lunch at earlier and change our table booking from 1:30 to noon. (next post on our lunch at Oliveto). After lunch, we hit the second day of the annual sales and went straight to hip and happening Harvey Nichols and then to legendary Harrods. After several hours of retail therapy, we stopped for a quick energy-boosting espresso and macaroon at the ground floor Laduree before heading upstairs to the Toy Kingdom department then to meet a friend for tea the Georgian Restaurant – a full day in London of museums, shopping and eating.